I had an issue where my Presonus Firestudio Project would have a red blinking light when I turned it on. This was before I even plugged it into my computer. Determining that it wasn't a software issue, I decided to open the thing up and figure out what's going on. I did the usual and checked for any bulging capacitors, burn marks, or just anything that would give me a clue why this wasn't working. I found some test points on the board labeled with voltages and decided to test them with a DMM. The DMM was reading way below the indicated voltages and they were actually swinging back and forth which led me to conclude that this must be a problem in the power supply board. 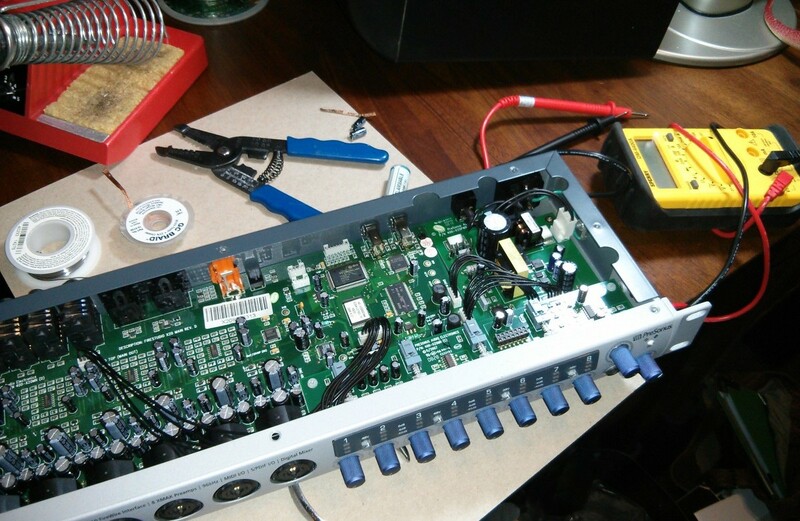 I took the board out and visually inspected the capacitors and couldn't find one that looked bad. Therefore I ended up just purchasing replacements for all of the capacitors on the power supply board and decided to just replace them and see what happens. After replacing all the capacitors on the board, I carefully plugged in the board and a solid red light came on! Overall, be careful when working with large capacitors like this (There is a 450V one on this board). I made sure they were discharged with a large low ohm resistor to make sure I didn't get a nasty shock. Below is a picture of the board all fixed up!